Forgiveness is hard. It doesn’t seem fair. It goes against what the world wants us to do. But forgiveness is what God calls us to. “There was a man who had two sons. The younger of them said to his father, ‘Father, give me the share of the property that will belong to me.’ So he divided his property between them. A few days later the younger son gathered all he had and traveled to a distant country, and there he squandered his property in dissolute living. When he had spent everything, a severe famine took place throughout that country, and he began to be in need. So he went and hired himself out to one of the citizens of that country, who sent him to his fields to feed the pigs. He would gladly have filled himself with the pods that the pigs were eating; and no one gave him anything. But when he came to himself he said, ‘How many of my father’s hired hands have bread enough and to spare, but here I am dying of hunger! I will get up and go to my father, and I will say to him, “Father, I have sinned against heaven and before you; I am no longer worthy to be called your son; treat me like one of your hired hands.”’So he set off and went to his father. 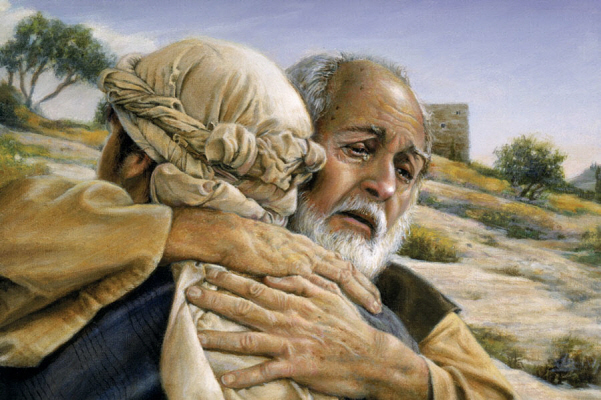 But while he was still far off, his father saw him and was filled with compassion; he ran and put his arms around him and kissed him. Then the son said to him, ‘Father, I have sinned against heaven and before you; I am no longer worthy to be called your son.’ But the father said to his slaves, ‘Quickly, bring out a robe—the best one—and put it on him; put a ring on his finger and sandals on his feet. And get the fatted calf and kill it, and let us eat and celebrate; for this son of mine was dead and is alive again; he was lost and is found!’ And they began to celebrate. We so often focus on the younger brother, but I would like to focus on the older, through the lens of forgiveness. The question then does not then have to do with whether the younger son repented or not. The question is rather, is this son a member of the family or not? We should not move too quickly to condemn the older brother. His father is asking him to forgive his younger brother. His father is asking him to forgive and leave behind all that his brother had done — how he had wished his father dead by demanding his inheritance; how he had abandoned his family and his faith; how he had wasted everything he had been given until he was left with nothing. This younger brother has hurt him deeply. His father is asking him to bring the younger brother back into the community, to redeem him from his trouble and debts. It will cost the older brother dearly to do what the father is asking him to do. What should he do? If he goes to the feast, everything will change. There are absolutely no assurances that his younger brother won’t just leave again — that he won’t fall back to the same behavior. Why should the older brother welcome back this black sheep of a brother back? Why should he show him any compassion? I think we can all identify with this older brother. Forgiveness is hard. This parable, however, demands that we forgive and accept those who have not been faithful and just and responsible. It also demands that we know what we are doing when we forgive such people. Forgiveness is always an awesome and frightening act. Asking someone to forgive at all takes courage. How can you forgive someone who always lets you down? The parable is a call to live by grace. We are given a mission to bring in the marginalized — those who have strayed away from the family. No one ever said living by grace is easy. Sometimes it demands that something in us must die without knowing whether that will come to life again. The world we live in is not hospitable to people who want to live this way. It is not an easy help, but it is a life of grace.